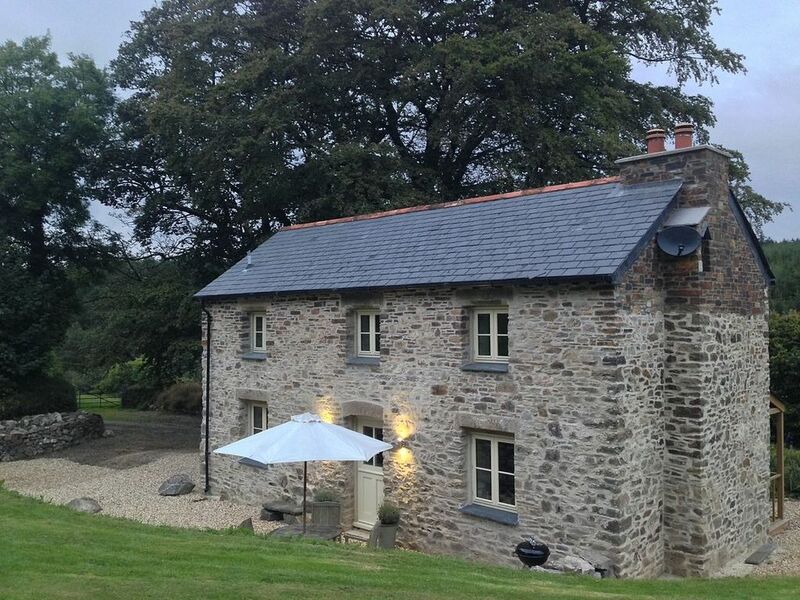 A stunning bolt hole set amongst the wilds of North Cornwall. Dibbles Cottage is perfectly located for a stunning break in Cornwall. Perched on the edge of the valley overlooking Hustyn woods, Dibble's is the perfect place to come and relax and wind down from the stress of everyday life. Positioned within striking distance of both the dramatic North coast and the soft undulating hills of the south but we don't think you'll want to be going anywhere for the first couple of days! Richard grew up there but that I aside, we couldn't find anywhere more peaceful or beautiful. It's perfectly remote yet only three miles from the supermarket ! Close to the North and South coasts and out of the craziness of mid summer ! It truly is unique, you'll struggle to find a Cornish gem better than this one. Whether you love, walking, cycling, surfing or just plain chilling ! Cosy living room with Erkol sofas and armchairs. TV, freesat and bluetooth media player for your devices. Wood burner if you need it ! Oak floors with underfloor heating, sheepskin rugs over dining chairs for that added luxury. Compact and extremely well equipped kitchen. With Microwave, oven, hot plates, kettle, toaster and a large selection of pots, pans, knifes and baking kit. Underfloor heating to keep your feet toasty and oak floors. Outside: Dibbles Cottage is on a farm and surrounded by two acres of lush private gardens with direct access to the forestry track network and the camel trail beyond. Wild swimming in our spring fed lake ! Outdoor furniture and a bbq is outside the cottage Cleaning / Towels / Linen / Maid service: All white company linen and towels included for the master. Please bring separate bedding for the single or cot if required. For bookings of two weeks or more a freshen up and sheet change is included. Other: Stunning full length veranda outside with beautiful views down the valley, a great addition if you get a rainy day ! The cottage was truly lovely - clean, cosy, very comfortable and in a beautiful setting. Fantastic walks on your doorstep. I highly recommend and would return. It’s off the beaten track, but a truly lovely spot. Lovely bed, modern furnishings, and kitchen. Nice and warm with good underfloor heating. Dog friendly. Not to far from either coast- so you can flip about. Not far from Padstow,Wadebridge. The cottage is situated in lovely grounds giving a peaceful, remote feeling. The tracks from the main road to the cottage are a little bumpy but fine in our small car. Cottage had good underfloor heating and a generous supply of logs. It was clean and well decorated. We received lovely local biscuits, a pint of milk, sugar, tea bags and a few coffee sachets to settle us in. Location is good for easy access to Wadebridge, Padstow, Newquay, and for travelling further a field. Fairly close to A30 for easy access, but some very narrow (but not busy) roads to then get to cottage - to be expected in Cornwall. We would visit this property or The Mill (same site) again. The owner lives nearby on the farm and was very friendly, helpful, and gave us some good tips on places to visit. Good location. Remote. Worth a visit. We loved every minute of our stay in this beautifully decorated cottage. Small details made us feel welcome ( coffee, tea, biscuits....) and the stunning surroundings offered us all the peace we needed. We explored the north and south coast of Cornwall and made great walks on the costal path. An evening at Rick Stein’s Seafood Restaurant was a real bonus. We will recommend this cottage to our friends in Belgium. The cottage was beautiful, very clean and in beautiful surroundings. Richard was very welcoming and easy to contact if we had a question. The cottage had everything we could need. We really enjoyed the peace and quite while having a little bbq in the evening. Really wish we had booked for longer. Would 100% recommend to stay here and will definitely book again. Thank you Richard. Approximately twenty minutes to the closest beach at Polzeath. Padstow is half an hour as is Trevone Bay. Watergate is around 25 minutes. Our nearest airport is Newquay half an hour away and Bodmin Parkway station is around twenty minutes by car.